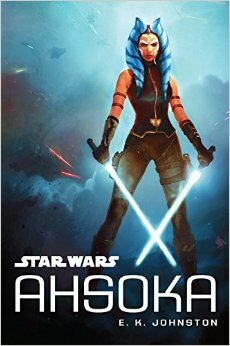 The latest Star Wars novel, Ahsoka, came out in mid-October and I finished it in two days. I always love picking up the newest Star Wars book and it's been really fun keeping up with all of the new canon since Disney pushed the giant reset button on the universe. Ahsoka was an ok book. It didn't blow me away with awesomeness but it wasn't bad either. It will definitely be for some people and not for others. To me, it felt like a long story arc from one of the TV shows, Clone Wars or Rebels, that has been moved over into novel format. It bridges the gap between those two shows and reveals what happens to Ahsoka during that time period. For that, I love it, just because I always want to expand my Star Wars lore. But, I feel like it would have been better in show format. I could easier see this as a bonus story arc in either of the shows. It's probably a consequence of the main character being a unique character to Clone Wars and Rebels and not being anywhere else in the Star Wars universe. With all that said, if you're a fan of either the Clone Wars show or the Rebels show and you like Ahsoka herself as a character then there's definitely something for you in this book. If you don't fit into that group this novel will still give you more information about the formation of the rebellion, which is cool, but it might not resonate with you in terms of character. I'm really glad I read this book once but I won't be recommending it to a ton of people. Based on what I've already told you, you probably know if it's for you or not.